Friday 23 September many different lambahaony’s were to be admired at Centre Lambahoany. Dosy and Lucienne had organised an evening with different groups all dressed in multicoloured lambahoany’s. Traditional instruments, traditional music, traditional clothing and traditional dance, including spinning with a bottle filled with water on the head! Acting out traditional life (planting rice, harvesting rice, pounding rice, eating rice) completed that part of the evening. Next Dosy and Lucienne proved they are not only good at organising but also have good singing voices. 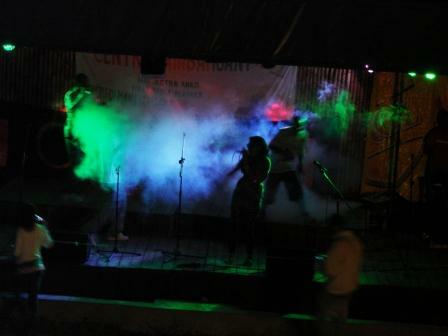 Rap, R&B, Reggae en Roots, the ingredients of a sparkling show created by the two Rasta’s from Mahajanga, that rocked Centre Lambahoany. The local artist Shao Boana had already loosened up the audience, and with Mirajeky they could really go crazy. One swaying mass of happy youngsters, joining in the singing, underneath a starry sky was the result. 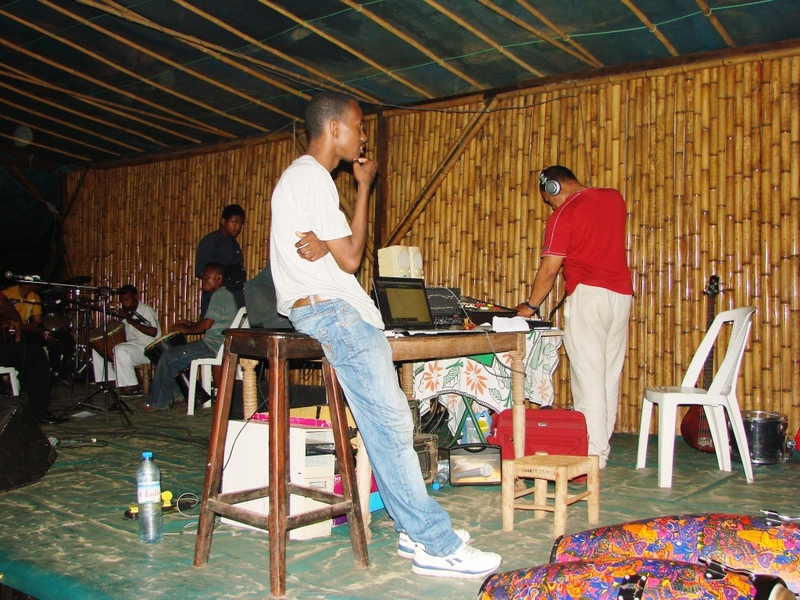 The organisation, Association des Jeunes Organisateurs de Tamatave, had found two major sponsors for the event: Skol, the new Malagasy brand of beer, and Orange the telephone company. They most certainly will not regret their sponsoring. 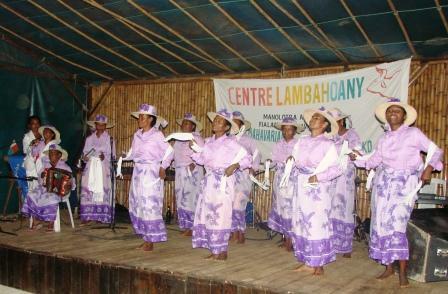 The weekend of 13-14 of August, Centre Lambahoany was host to the VAKOKA GASY traditional dance and music festival. 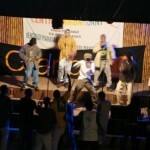 Several groups performed different kinds of music and dance from several parts of Madagascar. One group of dancers after the other mounted the stage, dressed in lambahoany’s, did their best, accompanied by accordion, valiha and djembé. A less traditional rapper also did his share. That sounds great in Malagasy! the public came in large numbers and enjoyed it to the full. On June 26th Madagascar celebrates its independence. It is also the beginning of the school holidays. On the eve of the 26th there is a traditional display of fireworks. For the first time there was also a roaring party at Centre Lambahaony. 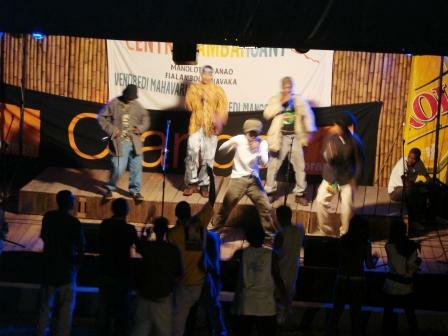 All secondary schools were invited to have their talented students perform at Centre Lambahoany. It was a tremendous success. All morning different martial arts groups showed their skills. Well known martial arts were represented, like Karate, Tae Kwando, Poekoelan, Capoeira and Kick boxing, but also two Malagasy Kung Fy styles: Kung Fu Kudo Washi and Kung Fu Ga Ma Ka. At 3 o’clock p.m. the music- and dance groups mounted the stage. 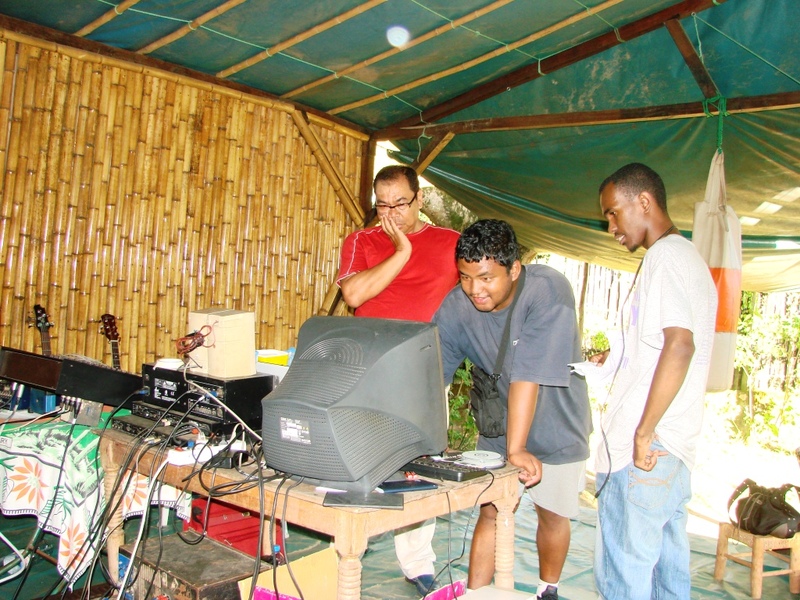 Many different styles of music could be heard, rock, punk but also traditional Malagasy music and dance. It was a good atmosphere all day long. Everyone applauded for all the artists, also – especially – those from other schools. The disco afterwards lasted till the early hours. June 26th is an important day in Madagascar, the day the country became independent after almost seventy years of French colonial rule. Traditionally in Toamasina, this day is commemorated with a parade on the Avenue de l’Indépendance, where all kinds of social groups present themselves. On the urgent request of the Poekoelan students of Centre Lambahoany, the Poekoelan School participated in the parade. After waiting for several hours, the students paraded the Avenue where Important People and ordinary people were watching. Together with representatives of other Martial Arts they formed a colourful procession. Centre Lambahoany was mentioned twice by the announcer: Poekoelan of Centre Lambahoany and Capoeira of Centre Lambahoany! For three days the Centre Lambahoany domain of the national radio station RTA. Starting at 7:30 in the morning several local music groups and bands made an appearance to play and give interviews. The recordings will be broadcasted nationwide all week. Many of the musicians had already performed at Centre Lambahoany and in the interviews the name of the Centre was often mentioned. Although silence was required as not to disturb the recordings, those at the Centre could enjoy all kinds of music, from SLAM to rock, from traditional music from different parts of the country to church choirs with religious songs. 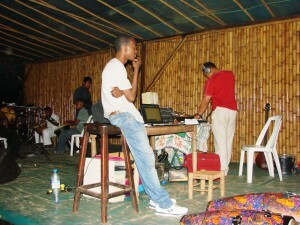 By now the RTA crew has returned to Antananarivo, tired and satisfied and the Tamatave music is a little better known. Music, music, music. Slam or the African sound of the Antanadroy traditional music, the ever popular salegy, but also hip hop and drum rolls that accompanied the acrobats. It happened at Centre Lambahoany during the weekend of 24, 25, 26 September. No less than 25 groups made an appearance. The Angaredona festival is a yearly event in the Capital Antananarivo, an initiative of the internationally acknowledged jazz- and world musician Rajery. Last year was a try-out for an Angaredona in the provinces. Centre Lambahoany in Toamasina had the honour. That was much to everyone’s liking. The local organisation Kolon’Art ran their feet off to fix things up, these last months. It paid off, it was an overwhelming success! Friday evening was the pre-festival for invited guests with the three best groups in town: Mivehy, Ny Zanaboanio and our very B-Sarouk. Those three also closed the show on Sunday. That day the festival was free. In the afternoon the coming talented youth had the stage: Tony Velonarivo, Miarakandro, Satreky alternating with better known groups as Ragnetse, Tsilavina du Sud and Rababalah. And there was a reggae band of course. The public could not get enough of it and it was almost midnight – hours later than planned – before B-Sarouk’s basesa could intoxicate the public one last time. A worthy end of a worthy festival. The biodiversity on Madagascar is huge, but so are the amount of threaths for conservation of the species and habitats. The UN have called out the 22nd of May to be the international day of bioversity and 2010 the international year of biodiversity. Of course we couldn’t let this pass us by unnoticed, especially at the biodiversity hotspot that is Madagascar. Park Ivoloina therefore organized several activities at their park during a 3 day event. The celebrations of the ‘day of biodiversity’ started at Centre Lambahoany. A day full of activities and events to create awareness on the importance of biodiversity, such as the election of Miss and Mr Biodiversité from at least 400 schoolchildren. B-Sarouk gave a wonderfull performance. 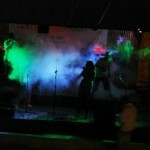 After this the celebrations continued with a defilé towards Avenue de l’Independance in the city center of Tamatave. The following days the celebration continued at Park Ivoloina, a recreational, zoological and educational park, with expositions and explainations on the biodiversity in the region. We have learned about the threatened fish populations offshore, the diversity of animals which live in the region and special attention for the bees, who are starting to disappear in the region. The latter would be a devastating trend because without the bees the fruits can’t survive, and the litchis is the nr. 1 industry here. 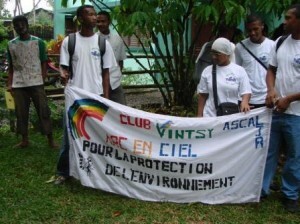 So let’s celebrate and protect the biodiversity of Madagascar!